A national database of alpaca herdsires available for service and sale to assist alpaca breeders in locating an alpaca stud for their alpaca breeding program. Breeders of Suri & Huacaya Alpaca in New Zealand. Stud services to Suri & Huacaya Machos. Alpaca for sale. Full time Alpaca farmers aiming to achieve 'alpaca royale' fleece. Huacaya alpaca farm in Navasota. Breeding, boarding, and alpaca fiber available. Alpaca breeders also offering alpaca products for sale and photos. Located in Fischer, TX. Brian and Frieda Schieber specialize in alpaca products and helping you learn about the alpaca lifestyle. Island West Alpacas. Your personal alpaca resource on Vashon Island, WA. Just minutes from Seattle, WA, we specialize in alpaca products and helping you learn about the alpaca lifestyle. Oregon alpaca farm offering a focused alpaca breeding program producing high quality alpaca breeding stock. USA. Manufacturers of light and worsted weight, and bulky yarns for knitting applications, from alpaca fibers. Also, custom processors of raw alpaca fiber. Links to related sites. 'Wisconsin alpaca farm with full Peruvian and Accoyo Peruvian alpacas for sale and alpaca information. Raising and selling exotic livestock. Alpacas for sale. Alpaca Expression of Canada features high end and every day fashion. One of Saskatchewans larger alpaca ranches. Canadian made alpaca fashion. A family-run alpaca farm near Flemington, and is a full service alpaca facility offering alpaca sales, stud service, consignment, boarding, and breeding. Spa Alpacas is a full-service alpaca breeding farm. The farm provides alpacas, fleece products, educational alpaca seminars and complete customer support services to new and experienced alpaca breeders. Located in Ballston Spa, NY. USA. Agricultural cooperative for North American alpaca breeders, focusing on the development, collection, processing and market promotion of alpaca fiber and its products. Links to related sites. Alpaca fiber mini-mill providing alpaca owners with roving, yarn and felt from the fiber of their own animal. Sales include Huacaya Alpacas, Ashford Spinning Wheels, knitting machines, fiber and yarns, and custom knitting. Located in Newberg, OR. Socks, rugs and knitwear made from luxurious alpaca fibre. An alpaca breeder located in the White Mountains of New Hampshire. Alpaca management systems, alpaca products and shearing equipment. Alpaca breeders, alpaca products, calendar of events and guestbook. Located in Waldoboro, Maine. Producing Alpaca and Alpaca fiber. A suri and huacaya alpaca breeder located near Minneapolis. Website and Graphic Design catering only to the Alpaca Industry. Describes alpaca herd and breeding with information on availability and pricing. If the business hours of IMpaca! Intermountain West Alpaca Association in may vary on holidays like Valentine’s Day, Washington’s Birthday, St. Patrick’s Day, Easter, Easter eve and Mother’s day. We display standard opening hours and price ranges in our profile site. We recommend to check out impaca.com for further information. 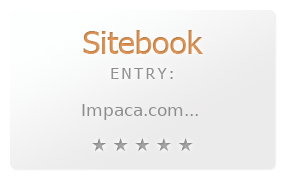 You can also search for Alternatives for impaca.com on our Review Site Sitebook.org All trademarks are the property of their respective owners. If we should delete this entry, please send us a short E-Mail.